The client service staff here at Yalesville are very important members of our hospital team. Their duties include answering the phones, booking appointments for our clients, and admitting patients for surgery and/or daily testing. Seeing that our client service staff are the first and last people you meet, they strive to make your visit to our hospital a pleasant experience not only for you, but the members of your pet family. 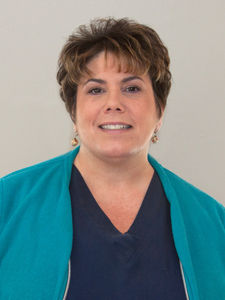 Lisa has been with Yalesville Veterinary Hospital since May of 2014. She joined our team when Yalesville and Meriden Veterinary Associates merged. Lisa come to us with 14 years of experience in the veterinary field. Lisa lives with 2 Rottweilers at the moment whom she competes with in obedience, rally, herding, barn hunt and shows her dog in the confirmation rings. Lisa also comes to us with 18 plus years of obedience training and teaches our puppy and adult dog obedience classes. In her spare time you can find Lisa ring side at dog shows and seminars as she is interested in canine communication and behavior as well as canine rehabilitation. She is also certified as a Canine Good Citizen instructor through the American Kennel Club. Jennifer joined the Yalesville Client Service team in 2015. She came to us with past experience in both human medicine and customer service positions. She has been an animal lover since she was a small child and has always dreamed of working in the veterinary field. Jenn enjoys talking with clients about their pets and giving special attention and love to all the pets waiting to see the doctor. She has a special place in her heart for cats and kittens and is very versed on cat breeds and characteristics. Jenn shares her home with 5 cats and her dog. She enjoys spending time with her family and pets. When Jenn isn't working she tries to venture outdoors as much as possible and her love of nature has fostered her new hobby, keeping an indoor garden. 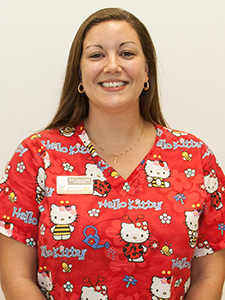 Lillian joined Yalesville Veterinary Hospital in 2015. 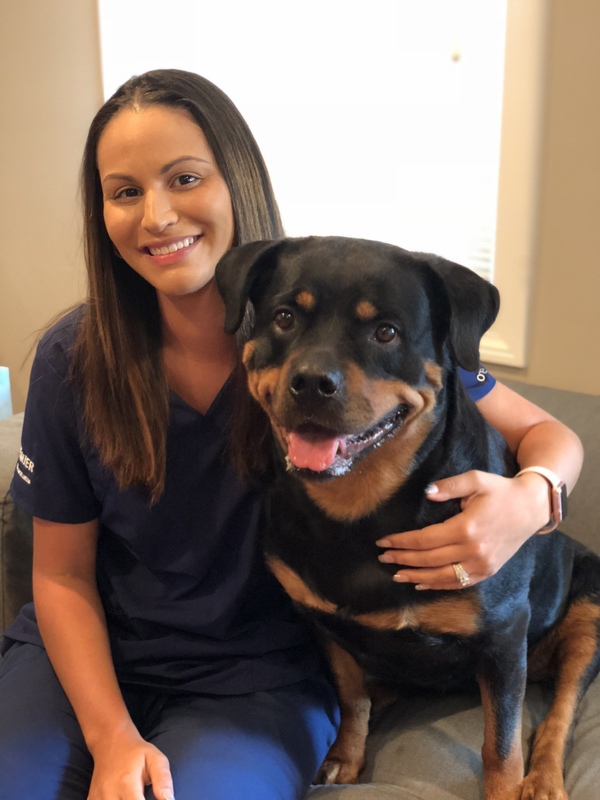 Her past experience was in the field of human medicine and although she was new to the veterinary field Lillian has quickly become versed in the needs of both our clients and their pets. Lillian provides excellent service combined with compassion to our clients. Lillian has loved animals since she was a little girl and she would spend hours with her uncle helping him take care of the many pets he fostered. She was the proud owner of her beloved boxer, Andy, who passed away in 2013. Although she does not have a pet at the moment, she hopes to one day adopt another. In Lillian's free time she enjoys spending time with her husband and step-daughter. As a member of the Client Service team Annette brings an extensive knowledge of animal care. Her background as a Veterinary Technician enables her to communicate with our clients regarding medical appointments and health updates. She shares her home with several dogs and the newest member of her pack, Arlo, loves to come to work and "share the love" with all the staff on duty. Sam came to Yalesville at the end of 2017. She joined our Client Service staff with multiple years of experience in customer service as well as experience working with animals from her previous job at a high end doggie daycare and boarding facility. 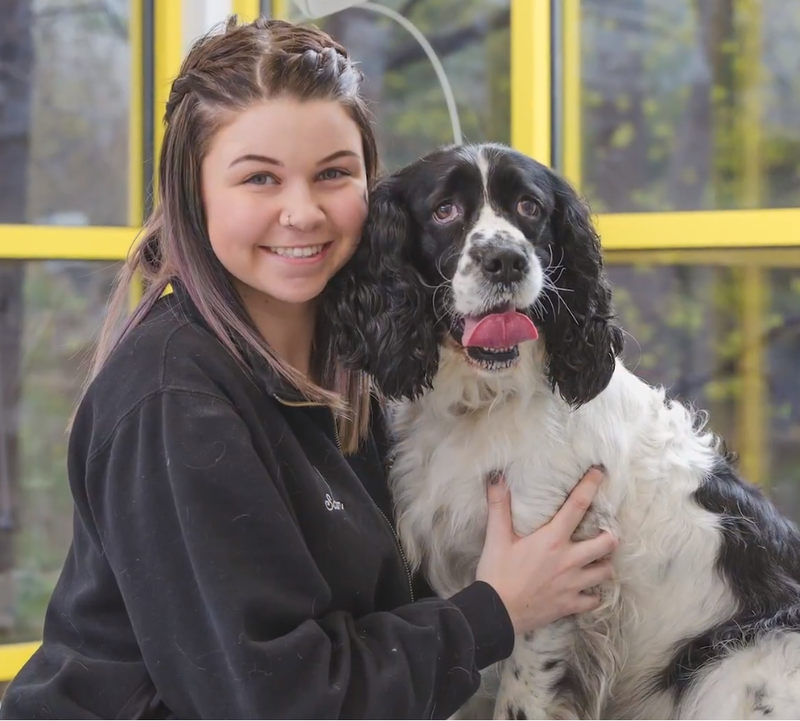 Sam really enjoys learning the medical aspect of caring for pets and hopes to one day become a veterinary technician. English Springer Spaniels are one of Sam's favorite breed of dogs and currently shares her home with two, Laci and Paisley. Cody is the newest member of the client service team here at Yalesville. 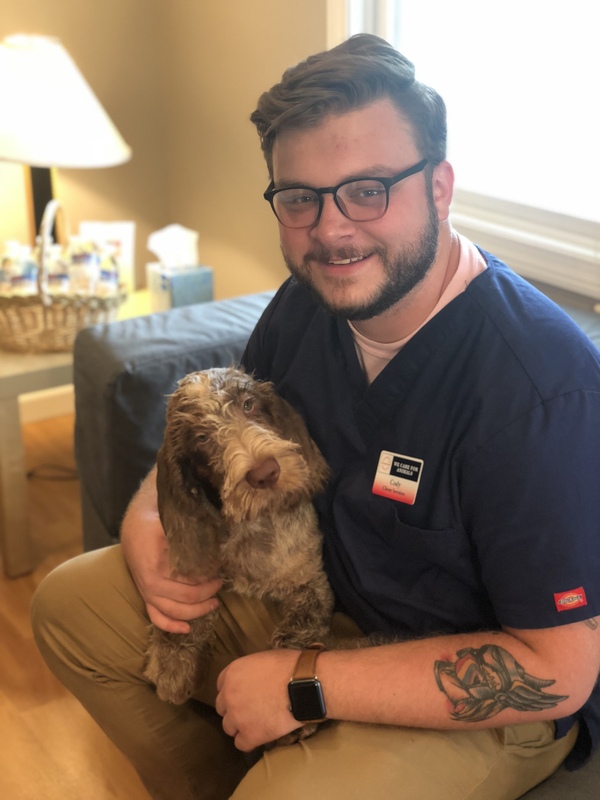 He has multiple years of experience working with animals outside the veterinary field as well as customer service experience. Cody enjoys working with both animals and people. Cody shares his home with several dogs and cats. Caitlin joined the Client Service staff working part time nights and weekends. Her love for animals brought her to us when she was looking for additional part-time opportunities. She shares her home with a British Shorthair cat names Risus.